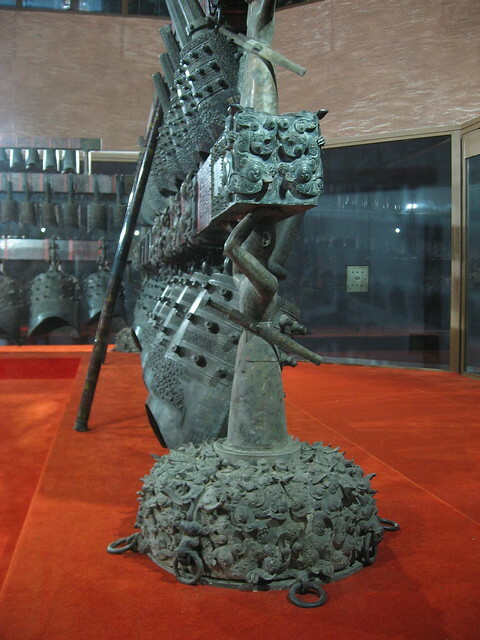 Bianzhong of Marquis Yi of Zeng is a relic heritage dated to early Warring States Period. 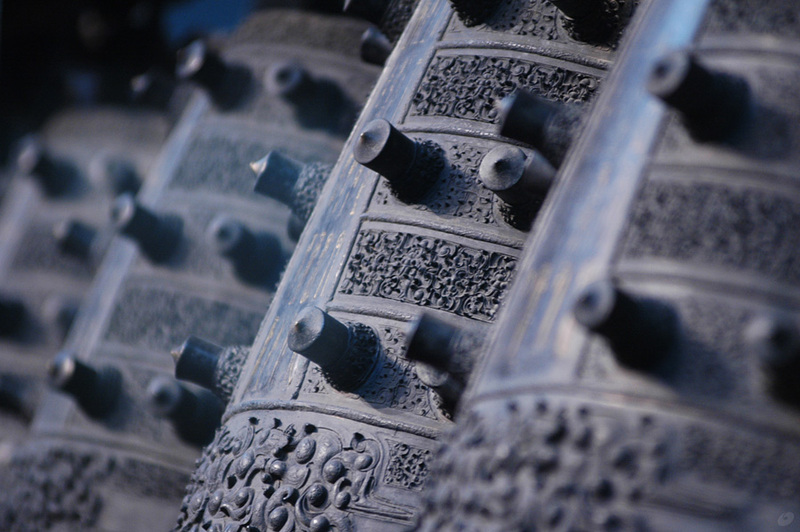 It was successfully excavated at Shuizhou, Hubei in 1978. As a “huge” instrument set consisting of 65 bronze bells, it covers five and a half octave and can play all 12 semitones. Its superb casting technology and great musical performance rewrite the history of world music. It is crowned as “an unique treasure among the world wonders” and “Eighth Wonder of the Ancient World”. September 1977, on a hill at the outskirts of Suizhou, Hubei, sleeping underground for more than 2,400 years, Bianzhong of Marquis Yi of Zeng was freed. This is an unprecedented discovery in the history of Chinese Cultural Relics Archaeology, the history of Chinese music and the history of Chinese metallurgy and casting. That day, in the process of a barracks expansion project, a garrison at suburban Suizhou stumbled upon the tomb of Marquis Yi of Zeng. This tomb has an area of 220 square meters, more than 6 times of Mawangdui Han Dynasty “super ancient tomb” found in Changsha. When the investigation team arrived on the scene, the borehole for construction was only 80 cm from the top of the tomb. If the workers had fired one more time to deepen the borehole, those treasures of the tomb which has been hidden through the ages would have ceased to exist forever. At 5:00am on May 22, 1978, after the water in the tomb drained, the magnificent Bianzhong revealed its true colors, all the people present were shocked by this exquisite bronze device: After two thousand and four hundred years, the 65 various sized bells weighing 2,567 kg still hung neatly on the wooden bell frame. 1. 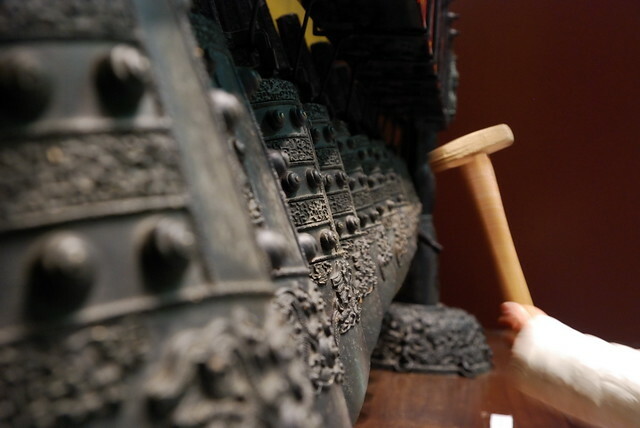 Bells are not unique to China; but bell sets were made into music instruments ONLY in China. What’s so special? Because the sound of regular round bells last too long to play any music. The bell sets made in China as instruments are ellipse shape, so the sound decays much faster. For the same reason, the bell can be sounded from two different directions (front or side) and produce two tones, especially for this one the two tones have harmonious three-degree interval between them. The tonal range of Zenghouyi Bells is from C2 to D7. In the middle area of the tonal range, it can play all twelve half tones. It is the earliest instrument in the world that could play all twelve half tones. 2. On the body of the bells, there are 2,800+ inscription words about the instructions for playing Bianzhong and highly developed ancient Chinese music theory. Especially the contents about temperament on the bells shows that China gradually developed its own temperament theory independently, not like previously believed to be adapted from Greek culture. 3. The bells are really high-tech not only because of their shape. According to scientific analysis, the relative portions of copper, lead and tin are perfect for producing the best timbre while making a durable bell. 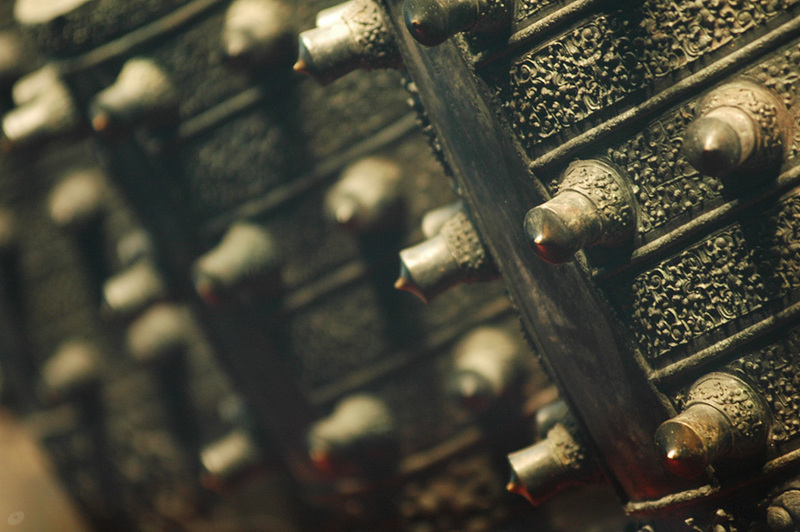 What’s more, even the patterns and spines on the bells are specially designed for best sound effects. In one word, these bells are a perfect combination of technology, science and music. 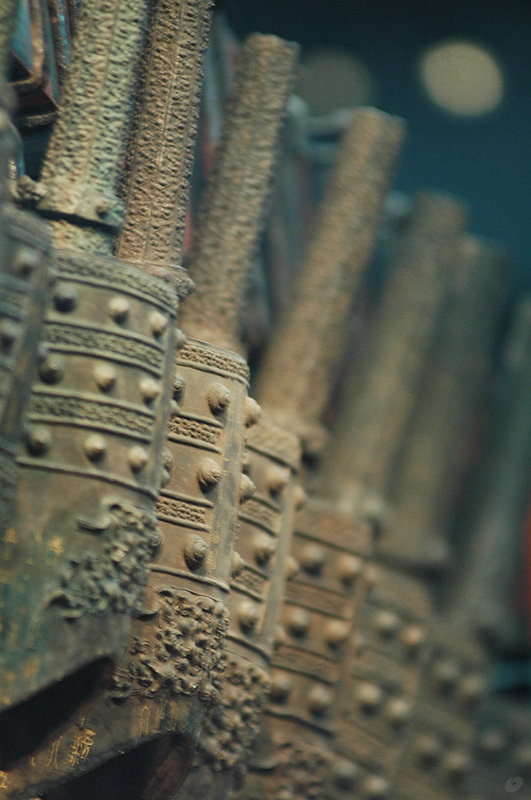 After excavation, the archeologists tried to sound the bells at a repair workshop in Suizhou. Later, musicians from Ministry of Culture arrived in Suizhou to carefully examine the sound of all 65 bells. Then in 8.1.1978, at a hall of local artillery division, after 2400 years of silence, Bianzhong sent the world its eternal romantic sound for the first time. To celebrate the 35th anniversary of new China, the player team of Hubei Provincial Museum was invited to Beijing with the original Bianzhong. In front of many foreign diplomatic officials, they played many famous Chinese and foreign music pieces including “A Moonlit Night on the Spring River” and “Ode to Joy”, etc. To celebrate the return of Hong Kong to China after 100 years of British rule, Bianzhong was specially approved to be played again for famous musician Tan Dun to compose the ceremonial symphony music “Heaven-Earth-Human”. As a symbol of Chinese culture, Bianzhong is very popular in important ceremonies and cultural exchanges. Of cause, since the use of original relics is so restricted, copies have been made to play in more occasions. As an well-known envoy of Chinese culture, Bianzhong is also busy touring overseas. So far, it has been to more than 20 countries and territories. About one tenth of the world population has listen to its charming sound by various means. Guests from more than 150 countries have heard its music in China, and some of them are lucky enough to play personally. Especially, in 2008 Beijing Summer Olympic Games, Bianzhong was used in the logo music that resounded at the start of each event – 18,000 times, according to Composer Tan Dun (again) – and the award music that was played when each of the 6,000 Olympic medals was presented to winning athletes. The excavation of Bianzhong shocked the archaeologists around the world, because two thousand years ago, it is extremely rare in the history of world culture to have such a beautiful instrument, such a magnificent band. 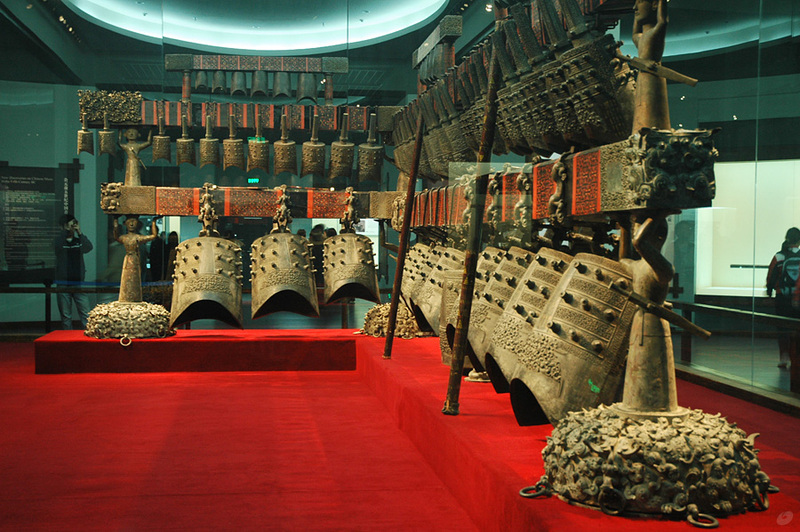 The successful casting of Bianzhong not only shows China’s great achievements in bronze casting technology, but also shows China’s level of development in ancient musical temperament. It is a crystallization of high wisdom of ancient Chinese people, and a pride of the Chinese nation. This is the 27th of 64 culture heritages that the government of China forbids to exhibit abroad. The complete list is here. In Chinese.